What The Heck Are You Drinking? Ever since I started posting pictures of some of my fruity smoothies on my Facebook page, some of my friends have been curiously asking me questions over the apparently weird contents of my daily regimen. “Is it nasty?”, “Does it kill you?” are amongst the many questions I have answered a number of times. Perhaps there’s no better place than here on my own blog where I can lay out all the answers of these frequently asked questions. Alright, let’s fire it up, and go! All of us know about the nutritional value of fruits and vegetables, but I feel that I have not been eating the required amounts in my diet. My occasional fruit intake is never going to deliver the healing effects they promise with such scarce quantities. Vegetables are often cooked with oil and sauces and despite its fiber content, most of its nutrients are already gone by the time they are served on a plate. Salads are rather expensive, and you probably get less than 500 grams of greens from one standard serving. I feel that I need a solution that can give me the most benefits of fruits and vegetables in a tasty and efficient manner. Why Don’t You Just Eat The Fruits And Vegetables Directly? Good idea, but not all phytonutrients can be absorbed by our body purely by chewing and normal digestion. With the use of a high-speed (35,000 rpm & above – revolutions per minute) food processor/blender, fruits and vegetables are chopped and ground into fine angstrom units that are perfect for phytonutrients to enter into our body cells. In other words, blended juice is much easier to be digested and absorbed by our bodies. Due to the high-speed motor itself, juices from these high-speed blenders are around 39 degrees celsius which can trigger the enzymes and magnify the phytonutrients in three folds. Nutritional value of the juices will deteriorate above 39 degrees. 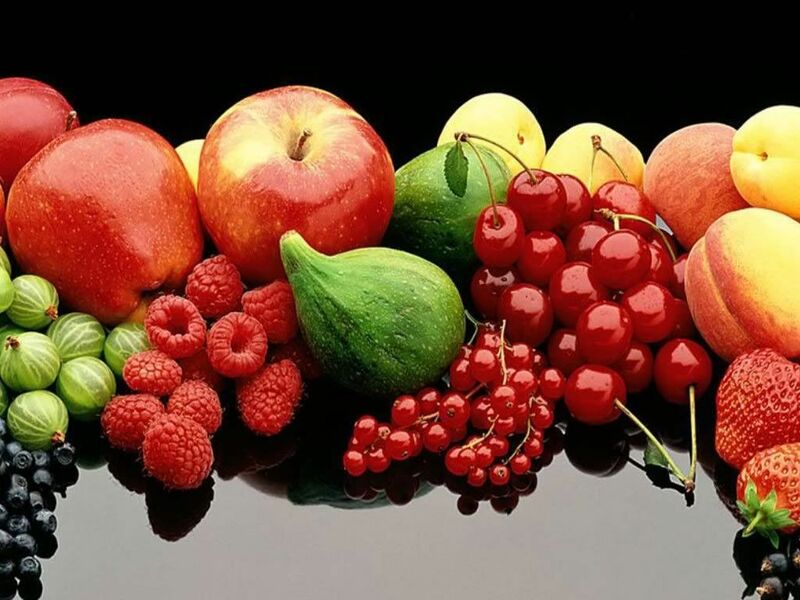 Lastly, the skin, seeds and core of fruits have the highest level of phytonutrients, though they are often discarded when we consume them in solid form. 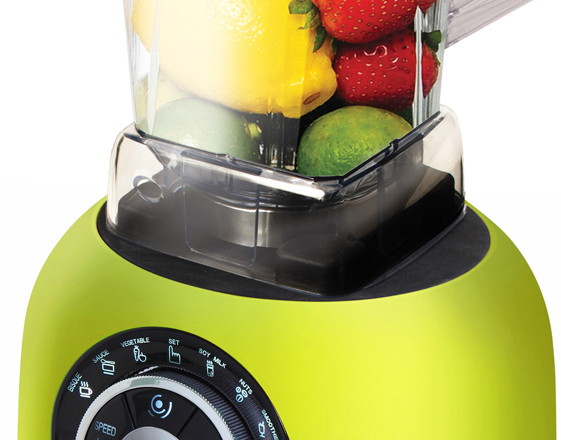 With a high-speed blender, we are not wasting any single bit of these fruits and vegetables. Phytonutrients exist in all fruits and vegetables and they help our bodies fight cancers and all kinds of diseases. They are extremely effective in healing our bodies without the need for modern medication. There are many types of phytonutrients depending on what fruits and vegetables you are getting. Thus, it is always beneficial to include as many varieties as possible in our daily diet. My earlier post 15 Healthy Foods You Cannot Afford to Miss covers these necessities in more detail. I Have A Juicer. Is That The Same Thing? There has always been debates about whether a juicer is better than a blender, or the other way around. I think it’s definitely up to your personal taste. To begin with, either one is going to do you wonders when compared to eating cooked vegetables or fruits in small amount. A juicer works without the need of adding water, and you get a perfectly smooth beverage every time. However, I think it eliminates our access of the most natural dietary fiber, let alone seeds, core and skin. I don’t want to just drink sugary juice. With my blender, there is nothing to clean except a simple rinse under running water since the whole fruit is ground into liquid form with the addition of water to facilitate the grinding process. I have wasted nothing. Needless to say, blended smoothies are going to be thicker than the watery form of pure juices. Yet you can control its thickness by adjusting your fruit/water content. The more water you are adding, the lighter the texture. You get the same level of goodness as long as you finish the whole thing. Hence, you can tell that I am more of a fan of the high-speed blender than a juicer. Can I Use Any Blender With Speed Lower Than 35,000 rpm? Your stomach will have to do more work to digest the veggies if they aren’t ground fine enough. You risk yourself stomach ulcer that way. You may not be realizing the true benefits of all the nutrients. The texture is going to be super thick if you put in a lot of goodies, and also you will end up spending more time in the kitchen cutting and dicing fruits before the blender can operate. All in all, not worth it. Better invest in a good tool if you want to do it right once and for all. 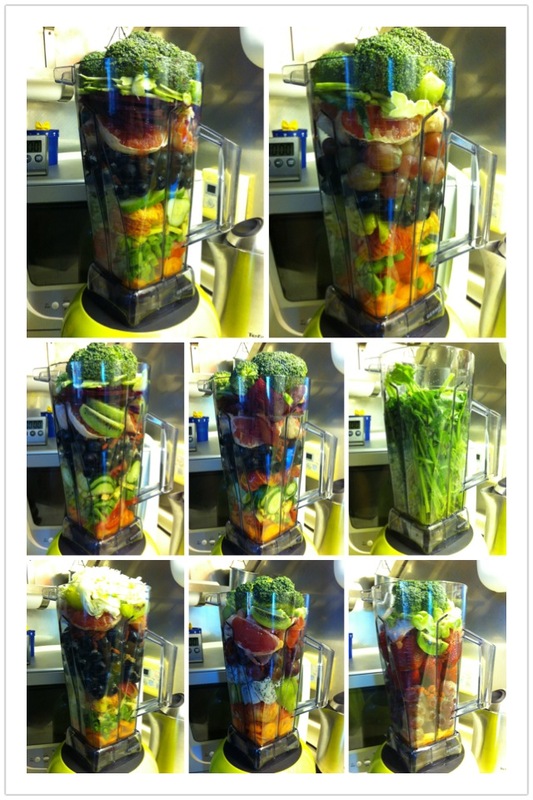 What Fruits And Vegetables Do You Blend On A Daily Basis? As I mentioned, I prefer the concept of varieties and balance. I like stocking my refrigerator with around 10 different fruits and vegetables on a daily basis. It’s easy to google the benefits and nutritional value of each fruit as you like, and my article above highlights the 15 super foods that I often incorporate as well. Lately, my must-have items include carrots, tomatoes, green beans, ginger, apples, pears, cucumbers, grapes, grapefruit, kiwi, beet root, broccoli, cabbages, black sesame and black soybean powder, flax seeds and cranberry mix, and wolfberries. The beautiful thing is that you can create your own mix according to your personal liking. I usually go down to the supermarkets and sample what’s in season. You really can’t lose with that. It Looks Overwhelming. How Does It Taste? Again, you know what each of these fruits and vegetables tastes like, so you already will have an idea as to the sweetness and sourness levels of your ingredients. I like to balance my tastes with the sweetness of grapes and apples and mix it with grapefruit and one or two vegetables for a fresh and layered taste. I first started with fruits only and it can ONLY taste good. I then figured that I wanted an even more balanced diet and started adding more greens to my mix which may not be to your liking. If that’s the case, just skip the greens and blend it some other time. Also, you don’t need to pack as much like me. Less ingredients with slightly more water will ensure a lighter smoothie which will be easier for beginners to adapt. Use the natural flavor of your ingredients to adjust the taste. Or simply stick to one fruit only as you can never go wrong with that. You don’t need sugar or honey at all. It’s up to you really unless you are aiming to reverse particular symptoms, which you can easily google the various recipes online. As normal supplements, you probably need no more than half to one litre a day, since you can keep it in your refrigerator for up to 24 hours. As I replace my breakfasts and sometimes even lunches with my smoothies, I go all out by filling up my tank with goodies for a 2-litre mix. I take half of it in the morning when it’s freshest, and leave the other half for the rest of my day. Whatever left in the fridge will grow slightly thicker over the cold so the earlier you finish it the better. Do not store it over 24 hours as it will go bad since there are absolutely no preservatives added. What Benefits Have You Personally Experienced From It? I’m not a medical doctor, and I have not taken physical examinations since then so I cannot provide scientific evidence here. However as a fact, I feel that I have a lot of energy even if I replace some of my meals with my veggies mix. The fibre keeps me full, and the smoothies are very easy to digest unlike regular meals with meats and processed foods. You will not have any constipation problems whatsoever, and you will feel your body cleansed and detoxed. My skin is better and brighter, as if the natural antioxidants are doing its magic. All in all, I can’t say for sure whether this is all psychological only, but again I can’t think it will be harmful to me as well. Not at all. I shop all of my ingredients from local supermarkets and they are imported from all over the world including China, United States, South Africa, Australia, New Zealand, Chile and Taiwan. I have done a rough estimate that my daily mix (2-litre) costs no more than HK$35 a pop. That’s cheaper than a Starbucks coffee, and almost the cost of breakfast in the city. Some fruits like strawberries and blueberries will certainly cost a bit more, but you don’t need them on a daily basis. I think this is one of the lowest cost healthy solution in the market. Of course, this is unless you decide to pick organic fruits and vegetables. I am sure they are so much better as they are free from pesticides and genetically engineered processes, but since they can easily cost up to 10 times higher, so far I have not been switching to organic just yet. In terms of the blender, there are a few options in the market. I don’t intend to promote any particular brands in this space as they each have their pros and cons. Leave me a message if you are interested and I shall be happy to share some of my thoughts. If you blend as often as myself, the daily cost of the blender is negligible. Check your allergies – Needless to say, you know yourself best, so stay away from suspicious foods instead of being overly adventurous. Beware of pesticides – For vegetables and fruits which you won’t be skinning, soak them thoroughly in running water before putting them in the blender. I know there are risks as with anything these days, but luckily for the 2 years I have taken this up so far, I have not had any problems with fruits and raw vegetables even if they are grown in China. Time – No I’m not talking about blending. In fact the preparation time is quite minimal, usually within 30 minutes which includes all the washing, cutting, blending and cleaning up. The key is getting fresh ingredients if you want to maintain this as your daily regimen. You can’t stock up too much since the ingredients are all perishable and they lose their nutritional value quickly. I almost shop every other day, sometimes even daily since I blend a lot. That’s why you need to assess whether it will be easy for you to find produce on a regular basis. If not, reduce the frequency to a manageable level. If you find it too time consuming or troublesome solely for the sourcing of your ingredients, I would advise you to drop the idea entirely. You will not be able to keep this up. So save the hassle and money of buying a blender. Picking a blender – This topic will be taken offline but I just want to say that aside from functionalities and all, you need to find something that requires the minimum effort of cleaning. As mentioned, if you need to spend 15 minutes cleaning up parts and filters and caps every day after usage, you will lose your drive altogether. Furthermore, if you have other cooking ideas in mind, pick the right blender as some can whip up puree, sauces and even desserts like mine. I once whipped up a hot ginger soup for myself that ended my months-long dry cough after only 2 days of serving. Leave me other questions if you have any. I am excited to share your experienes, anytime. Happy blending! Hello, just wondering which blender will you recommand? I was trying to look for a blender which have 35,000 rpm as you mentioned above. But I found that most of the display blender didn’t even mention the rmp…..
Just wondering…. are you using the Pro-S10? Thanks for sharing, am inspired to start making my own green smoothie in the morning. Have you tried adding pea shoots or wheat grass?